No matter how fierce and exciting the gameplay becomes, the best always maintain the required level of control and cold blood. Self-control gives them the confidence in achieving intended goals. 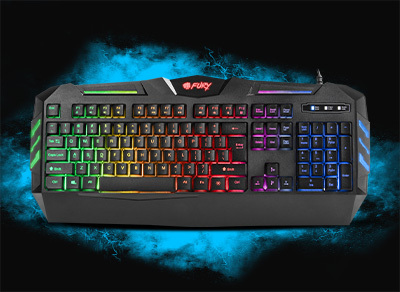 The Spitfire keyboard is not only a practical and functional tool, but also the right dose of comfort to help you in keeping calm and maintaining control over the game. 12 functional keys will allow you to take control of your multimedia at any moment. The Anti-Ghosting function ensures, that even the most complex key combinations will not affect the fluency and precision of your gameplay. The Spitfire also incorporates a Windows key lock which prevents accidentally switching to the desktop during gameplay. The lower part of the keyboard’s structure has been elongated to create a space, on which the gamer can comfortably rest their wrists and increase gameplay comfort. Additionally, it is also possible to adjust the keyboard’s angle using retractable kickstands. You will maintain control even, if your favorite drink is spilled on the keyboard. We have equipped it with a special system which drains the water outward.